Bus from Ipoh to Jitra is the only mode of transportation that to go Jitra from Ipoh because there is no train service serving this route. Many local especially working adult and students in Kuala Lumpur rely on this bus service to travel back to their hometown, Jitra, during weekend or school holiday. Kesatuan Express is the one and only bus operator offering bus from Ipoh to Jitra. Many locals prefer to take Kesatuan Express bus because of their punctuality and excellent quality of service. Kesatuan Express has strong presence in Ipoh because of its headquarter is also based in Ipoh. Kesatuan Express have total up to 5 daily trips. The earliest departure goes at 12:25am. The subsequent bus schedules are at 9:00am, 10:00am, 12:10pm and 5:30pm. The travel time from Ipoh to Jitra by bus takes on average 4 hours depending on the road traffic conditions. Washroom break will be given during the journey. The bus fare from Ipoh to Jitra is affordably charging at a fixed price RM 29.00. The bus from Ipoh to Jitra will pick up passengers at Aman Jaya Bus Terminal. Passengers could easily access to Aman Jaya Bus Terminal by taking shuttle bus in Ipoh town. Once the bus reaches in Jitra, the bus will drop off passengers at Jitra Bus Terminal. 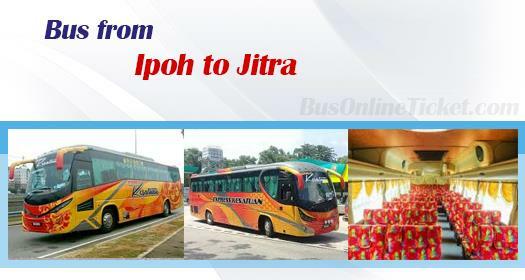 You can book your bus from Ipoh to Jitra via the most reliable online booking portal BusOnlineTicket.com. Making bus ticket booking with BusOnlineTicket.com, you will get instant confirmation upon payment. Making online booking with BusOnlineTicket.com could save your time and money to travel to the ticketing counter just to buy one or two tickets.